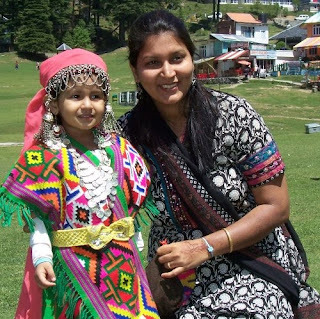 "No amount of handling deliveries as a doctor had prepared me for this"
Dr. Namita Lolge is a proud mother to 3-n-half year old daughter Nupur. A doctor by profession, who has helped many women deliver babies, it was a never-to-be-forgotten moment for her when she first held her child in her arms. "I have delivered many babies under my own supervision, and every time a mother held her newborn in her arms, it gave me a huge sense of satisfaction to bring that smile on her face. But nothing could have prepared me for the joy and amazement I felt when my own daughter was born." Namita, who is now 32, had a natural delivery. "There are so many things you hear when you are pregnant. But being a doctor I never believed in any myths or superstitions. And since I myself was aware of the changes my body was going through, I think it made me more careful and understanding of my moods and behaviour" she says. But then, with a sudden chuckle, she goes on to add a funny incident. Myth - "Look at a smiling baby and your baby will be born happy!" "I conceived while we were living in Hong Kong. And all through the pregnancy I was there. When you are pregnant, you are told to look at beautiful and smiling pictures of babies, so that your baby also turns out to be happy and smiling. Some people also ask you to put up pictures of happy babies in your room so that you see these babies on the wall and eventually have a baby who will look as happy as these little ones. I of course did not believe in any such remarks. But it was funny when my daughter was born, coz though I am a Punjabi and my husband is a Maharashtrian, our daughter inherited features that give her a kind of Chinese look" she says with a wink. Becoming a mother has surely changed Namita as a person. She has become more calm and tolerant for sure. And her outlook towards babies and kids has undergone a huge change. "Earlier I used to be irritated when babies would cry or when young kids would prance around and be naughty. Now, when I experience these same things with my daughter, I realise how much I have changed as a person. I don't find these traits annoying in other kids anymore." "A mix of both is what I want to be"
Today's mothers have the added responsibility of trying to keep up a friendship with their children. And Dr. Namita is no exception. When asked if she would like to be more of a mother or more of a friend to her little one, her answer was ready. "A mix of both. I would like to be her friend and be a part of her life even when she grows up, to know her friends, her lifestyle and her love interests, to have a rapport where she can share all her things and worries with me, but at the same time I would also want to be a mother, because sometimes there are situations which require you to be strict and firm. And you have to be a typical mother in such scenarios. So I would definitely try to make it a balance of both" she says. "My driving used to drive my husband nuts!" "Ok, so what were the things that irritated your hubby when you were pregs?" I ask her out of fun as we sit sipping from our tea cups. "But aren't you supposed to not drive and roam around too much when you are pregnant?" I asked. "The first three months are the most crucial. And later if you have no complications, you should try and lead a normal life as much as you can. Of course you have to make sure not to exert yourself and should keep a check on your and your little one's health, but other than that, you should continue your routine things like walking and going out and driving. Just be careful that's all." Coming from a doctor, that sounds assuring. "And what else irritated him?" "Oh..the one thing that drives all fathers-to-be crazy..My mood swings" she laughs. "And my food cravings. I developed such a sweet tooth in those days that every evening while coming home from work I would pick up boxes of sweets and come home and eat all of it. Plus after every meal I would still feel hunger pangs. So I used to get up in the middle of the night and drink cartons of milk from the fridge" she laughs, remembering those precious months. Nupur is now a little lady, she has started going to school and she is begining to have her own likes and dislikes. But one thing that still remains the same, in fact, has grown even more in all these years, is the bond that mother and daughter share. "I still remember the day she was born" says Namita. "It was a natural birth and my daughter was handed to me immediately after the initial examination. Much to everyone's astonishment I wasn't feeling tired or sleepy at all. So I wanted to enjoy that moment. Every time I picked her up in my arms she would be quiet and content. And the moment I put her down or someone else picked her up, she would begin to cry. It was an AWESOME moment for me. I had always imagined I would build a bond with my daughter as she grew up. But nothing could have prepared me to think she would start recognising her mother the moment she was born!" Amazing, isnt it? How a little one can change your life in such a lovely way, make you a better person, and give you one of the most beautiful and purest relationships you could ever wish for..
We wish Namita, Nupur and the family a wonderful experience throughout. Its Toy Story 3 !!!! Knowing You Are Pregnant !!!! The Sea and the Sea Lake.....!!!!! !